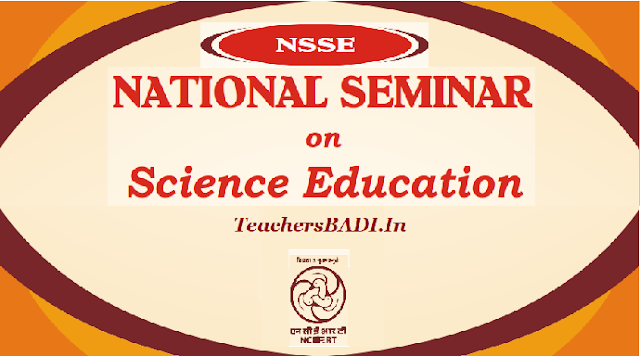 Guidelines for NCERT National Seminar on Science Education 2017, National Seminar in Science Education Registration Form, National Science Seminar Theme, Sub themes:: NCERT National Seminar on Science Education 2017 - National Seminar: Frontiers of knowledge are expanding very fast. Science is no exception. It is a dynamic, expanding body of knowledge, covering ever-new domains of experience. In a progressive society, science can play a truly liberating role, helping people escape from the vicious cycle of poverty, ignorance and superstition. The advances in science and technology have transformed traditional fields of work such as agriculture and industry and led to the emergence of new fields of work. People today are living in an increasingly fast- changing era where the important skills of innovation and creativity are very much needed for sustainable development of the society. These different imperatives have to be kept in mind in shaping new generations through quality science education. Good science education is true to the child, true to life and true to science. Science is the synergy of content, process and development of attitude. Science and Technology plays a vital role in the progress of a nation. Scientific processes are used for systematic analysis of observations and reaching at objective conclusions. Also one of the aims of science education is to inculcate scientific temper. There is always a need to plan and work for science for all to develop a scientific and emerging society. This National Seminar on ‘Science Education’ has been planned to provide a platform to all stakeholders working in the field of science education to share their experiences, researches, innovative practices and their impact in improving the quality of school education. This would help in providing directions to the curricular and pedagogic reforms for developing the emerging Indian society. • To make recommendations for future course of action for the promotion of quality school education in general and science education in particular. • To document the best practices and researches in the field of school science education and to disseminate the same with the stakeholders. This national seminar would consider papers pertaining to the theme ‘Science Education’. Research papers are invited from Science Teachers, Science Education Researchers and Faculty of DIETs, CTEs, SCERTs, SIERTs, SIEs, IASEs, NCERT, IISERs, NISER, Teacher Training Institutions, Colleges, Universities and NGOs etc to share their researches, experiences, innovative practices and experiments in the field of science education in the form of papers (oral or poster). The selected papers will be published in the form of proceedings. Abstract should be prepared by indicating the objectives, methods and procedure, tools, sample, major findings and implications of the study. Abstract along with registration form should be submitted only in the form of softcopy through e-mail to 2017nsse@gmail.com on or before the due date i.e. September 30, 2017. The manuscript of the paper should be typed in MS Word with Times New Roman - 12 font size and 1.5 line spacing. The length of the paper should not exceed 5 pages of A4 size including Tables, Figures and References. The paper should be submitted only in the form of softcopy through e-mail to 2017nsse@gmail.com on or before the due date i.e. October 25, 2017. Abstracts and Papers may be submitted either in Hindi or English language. The paper presenters will be provided travel assistance up to AC III Tier fare by the shortest route. The reimbursement will be made through online payment only on submission of original tickets. Accommodation would be arranged to the outstation delegates on payment basis on prior request and subject to availability. Location: Ajmer is well-known all over India as a historical and religious place of pilgrimage as well as an educational hub. It owes this reputation partly due to the Regional Institute of Education. The Institute is situated about 6 km away from Ajmer Railway Station in the midst of idyllic surroundings with the historic Anasagar Lake in front and the Aravali Hills all around. It is almost equidistant from the world famous Dargah of Khawaja Moinuddin Chisti and Teerthraj Pushkar. The distance of the Institute from the city bus stand is about 6 km. Auto and Taxi services are available from both the places (Railway Station and Bus Stand). Ajmer city is well connected with the trains from major cities of the country.